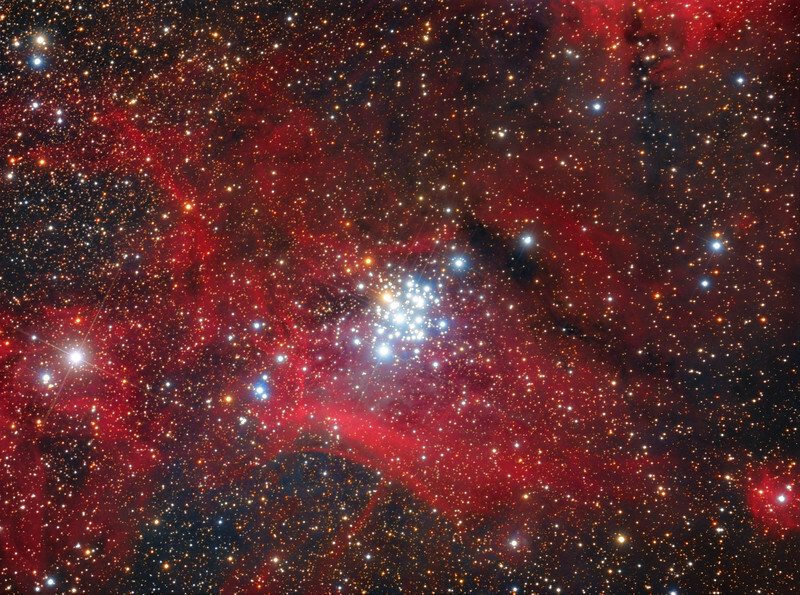 The Gem Cluster, or NGC 3293, is a very young and bright star cluster in Carina. It is one of the Southern Sky's finest binocular objects and consists of nearly one hundred stars huddled together in a tight group, with a contrasting bright red supergiant near it's centre - similar in appearance to Kappa Crucis in the Jewel Box Cluster. Floating against a colourful backdrop of Milky Way stars and red Hydrogen emission, the cluster is also surrounded by a delicate faint blue haze. This reflection nebula is likely composed of tiny dust grains left over from the cluster's formation some 10 million years ago, which are now reflecting the intense blue light from the young stars. The cluster was discovered by Abbé Nicolas Louis de La Caille in 1752 during his expedition to the Cape of Good Hope in South Africa.